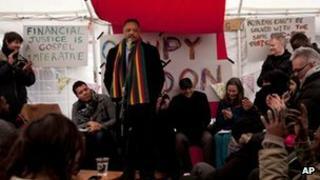 Image caption Reverend Jesse Jackson lent support to the camp's "Tent City University"
The Occupy protest movement is turning its attentions to schools through a new educational outreach programme. The idea developed after members of the St Paul's camp were invited into a number of schools and universities. The camp's "Tent City University" has won support from numerous high-profile speakers and academics. Former citizenship teacher Jamie Kelsey Fry says that with protesters due to be evicted within weeks, an outreach programme is the natural next step. Protesters from the Occupy movement - which campaigns against inequality, social injustice and corporate greed - have been camped outside St Paul's Cathedral next to the London Stock Exchange since 15 October. But they are expected to be removed on 27 January, after the City of London won a High Court case over their eviction. The protest group says the point of its occupation is to reclaim "the space in the face of the financial system and using it to voice ideas for how we can work towards a better future". Mr Kelsey Fry, who has been at the camp every day since it started, said it had become a focal point for young people interested in political activism, with teenagers travelling from all over the country to visit. Many had joined in its people's assemblies, where issues are discussed openly and everybody taking part is given an equal voice. He said: "So many of the camps, not just at St Paul's but around the country, will be cleared away in the next few weeks so outreach is a really good way to move things on. "Young people are a very large part of society and they are voiceless. They will be the people who inherit a troubled future." He added: "We are not trying to indoctrinate them or recruit them, we are trying to use the citizenship curriculum to give young people the tools to take up the issues that are important to them." Classes in schools would cover critical thinking, advocacy and how to take responsible action amongst other things, he said. Bishop's Stortford High School in Hertfordshire is likely to be the first school the Occupy outreach team visits. The school's head of citizenship, Simon Etheridge, told the Times Educational Supplement: "I invited Occupy to stimulate debate and discussion among the students about their politics and their world at the moment, as well as their views, for and against about the protest outside St Paul's Cathedral." When is it time to pack up and go home?